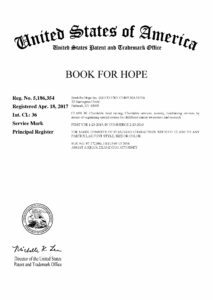 Congratulations, Book for Hope®️ on your registered trademarks for Book for Hope®️and Just Imagine®️! Please visit Book for Hope®️’s website (http://bookforhope.org) and Facebook page (https://www.facebook.com/bookforhope/). Also please look for their next Just Imagine®️ event.